Once you finish mixing your cookie dough, you will realize that the dough is pretty soft. So be sure to transfer to a parchment paper and gently shape into a log. If you want a square or rectangle cookies, go ahead and shape accordingly. :D I only need to put the dough in the freezer for 30 minutes, and it is firm enough to cut cleanly. How long you bake depends largely on how thick you cut the cookies. I cut mine to about 1⁄4” thick (~ 1⁄2 cm), and they are done after 25 minutes. Just be sure to start checking after 20 minutes, and simply eye ball it from there. My visual cue is to remove the cookies when I see the edges start to become browner. In a large mixing bowl, beat butter, sugar, and miso paste until pale and fluffy. Add egg, and beat until well mixed. 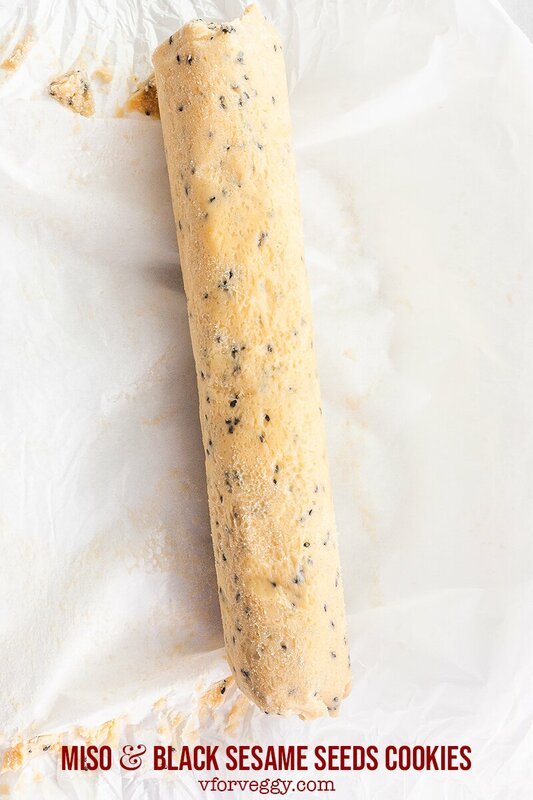 Add all-purpose flour and black sesame seeds. Beat again on lowest speed just until the dough comes together. 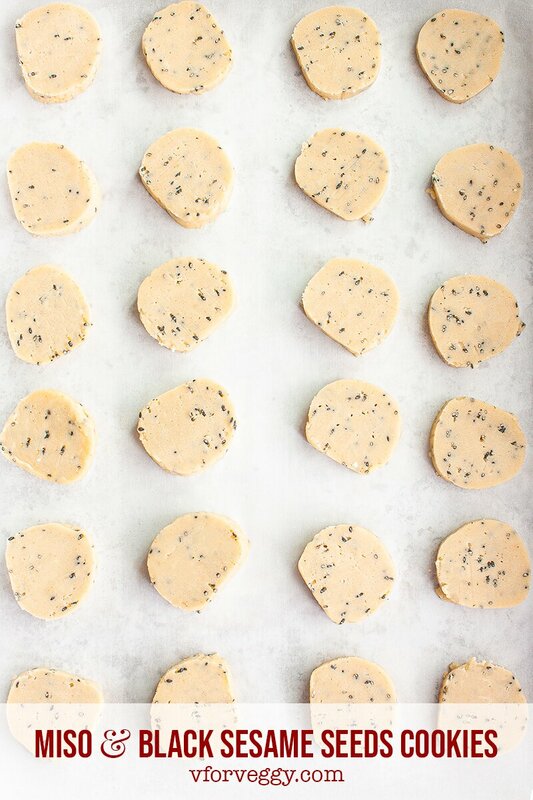 Transfer cookie dough on to a parchment paper. Gently shape into a 1.5" log (doesn't have to be exact). Rest the dough in the freezer for 30 minutes until firm enough to cut cleanly. Preheat oven to 180 Celsius (350 Fahrenheit) and line a baking sheet with parchment paper. Bake for about 25 minutes, or until golden brown and the edges look darker. Remove from oven, cool on a wire rack until room temperature. 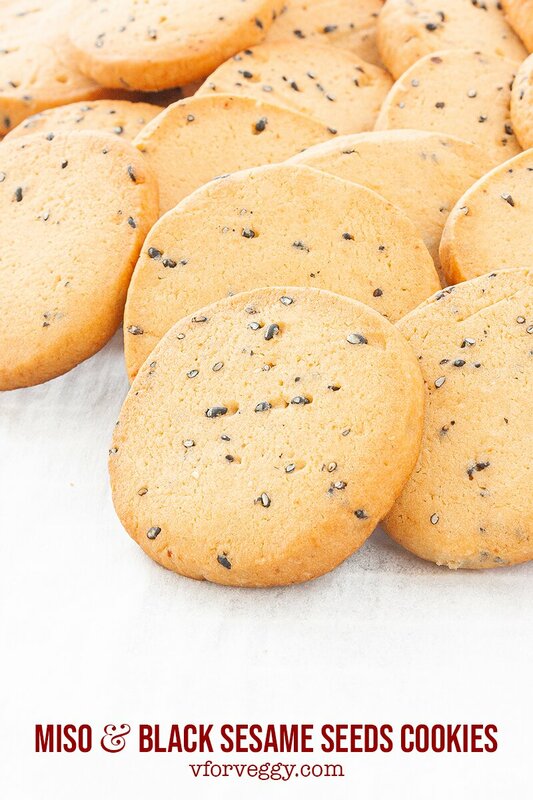 Store cookies in an airtight container for up to 1 week. 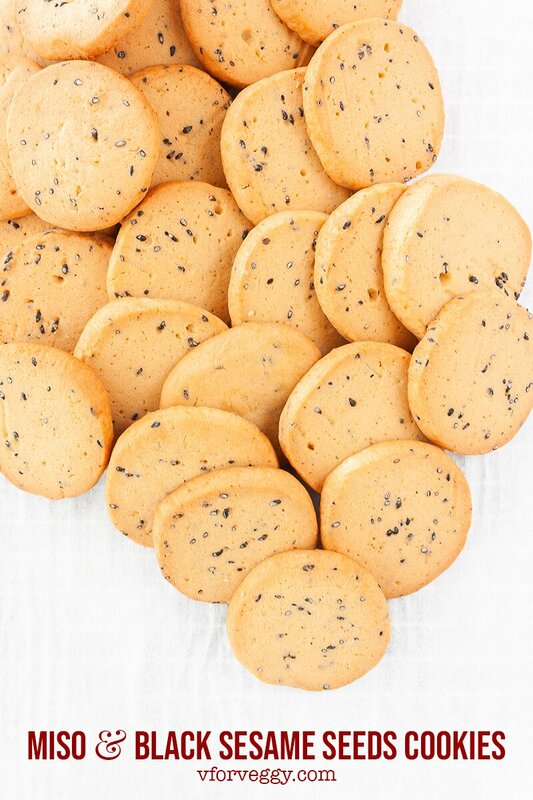 (*) The cookies don't expand much while baking. I use a half-sheet pan and arrange the cookies in 4x6 and none ends up touching each other.